Details on a giveaway at the end of this post. The single best thing about taking up sewing has been the ability to make things as I need them - throw pillows, gift bags, last-minute birthday gifts, passport covers, etc. This past Sunday, I was going home to visit my parents as is my usual wont for Sundays, but also wanted to bring some quilting stuff to work on. Well, I decided I needed a pouch (the green one in the picture above) to contain my scissors to prevent any accidental poking or holes. I showed it to my parents who said that I should show you all how to make one. This pouch is extremely easy to make and goes together quickly. It's also versatile. 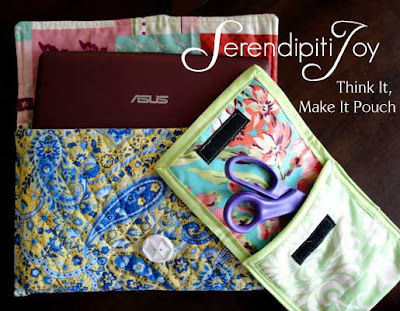 You can size it to fit whatever you need (covers for a kindle, iPad, small electronic, laptop, paperback, etc.) and it can even be waterproof if you use laminated fabric or vinyl. Use the directions below as a general guide for when you want to make your own. 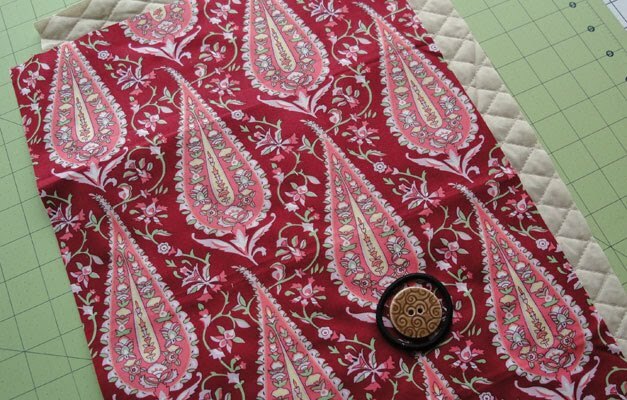 I recently joined an ugly quilt contest and was paired up with a quilter in Tennessee. The challenge requires me sending her some fabric from my stash for her to use to make her quilt; she will send me some of her fabric that I will use to make a quilt. I wanted to send the fabric in a nice pouch. Find the center of the edge of your exterior fabric where your pouch will fold over and pin your hair tie in place so that you can staystich it. You could also just use ribbon, but I like the hair tie for its stretchiness. 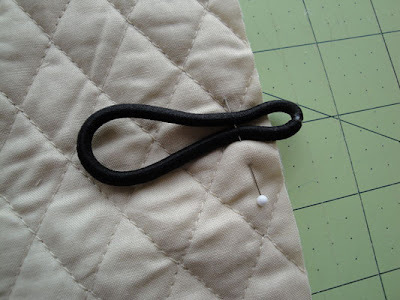 You want to pin the hair tie to the right side of your fabric. In my case, my exterior face doesn't really have a right or wrong side because both sides look the same. 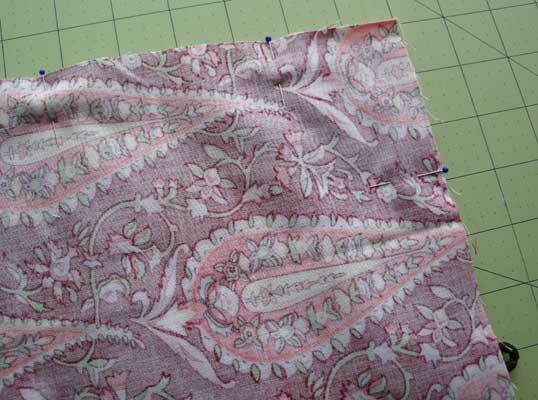 I started my staystich about one inch before and after the hair tie and about 1/8" from the fabric's edge. Place your lining fabric on top of your exterior fabric, right sides facing together. Your basted hair tie should be in the middle of your sandwich. 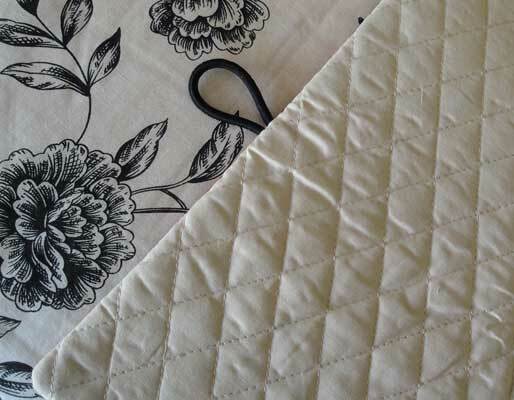 Pin the fabric together at regular intervals to prevent the fabric from shifting. You can see that the edge of the hair tie is just peeking outside of the fabric sandwich. That's because when you turn your fabric sandwich inside out, the hair tie will be facing out. 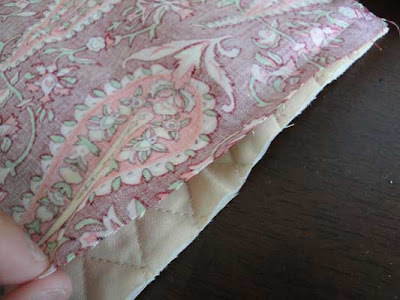 Use a 1/2" seam allowance to sew all around the fabric, but be sure to leave an opening of at least 3" along one of the sides of your fabric sandwich so that you have enough room to turn the fabric sandwich inside out. 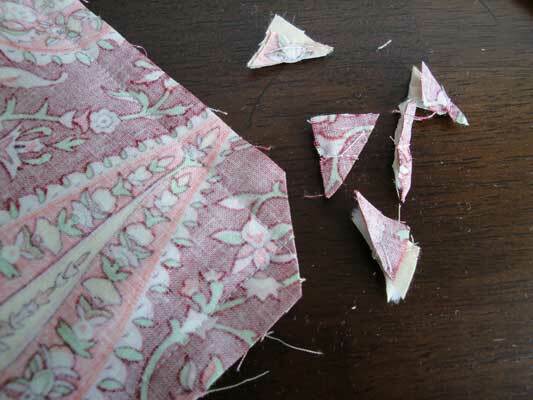 Do not sew over your pins. It's potentially dangerous because your sewing machine needle might break and fly into your face. Remove the pins as your sewing machine needle gets near them. To minimize the look of a messy finish, I chose to leave my opening along one of the sides where the pouch will fold on itself and not on the bottom or top edges of the pouch. 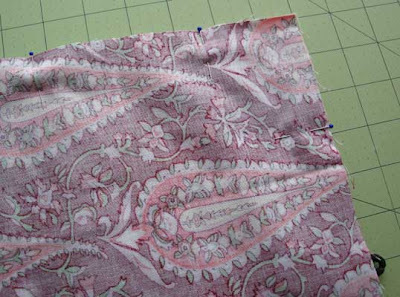 Trim the corners of the sandwich so that you will have nice corners when you turn your fabric inside out. Your fabric sandwich will look like when turned inside out; use a chopstick or other small instrument to help push the corners out, but don't push too hard. You don't want to make a hole. Iron your fabric sandwich to create a clean edge. You may have to fiddle with your sandwich to make the edges lie flat. Find the side opposite of your hair tie and topstitch about 1/4" from the edge. 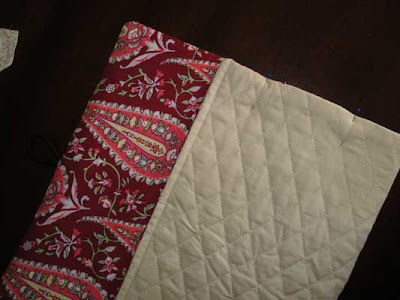 The topstitch is both decorative and functional. It reinforces the edge, but also maintains the design element for when you have to stitch your fabric sandwich together to make your pouch. 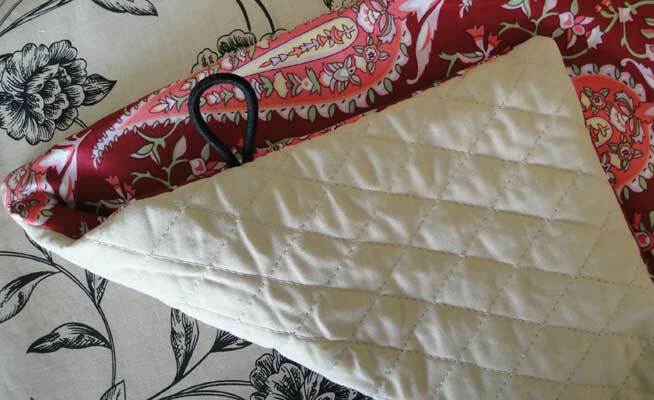 Fold and then pin in place the edges of your fabric sandwich to make your pouch as deep as you want. Remember that you still haven't sewn your opening shut. You will now. 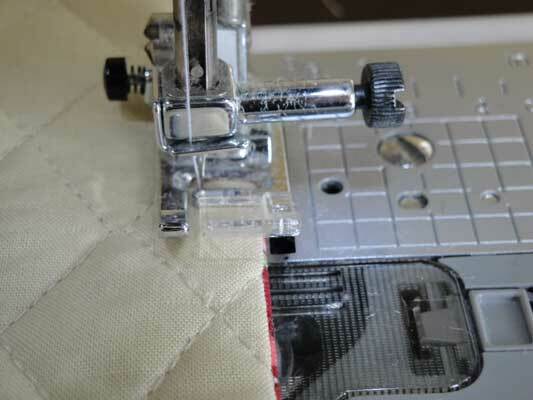 Starting from bottom edge of your pouch, topstitch a 1/4" seam all the way around your pouch. 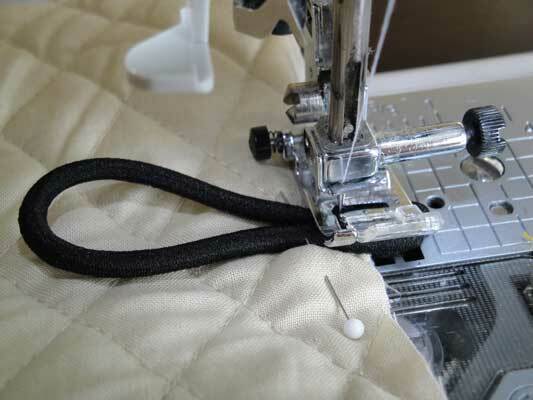 Do not sew over your pins; remove them as your sewing needle gets near them. 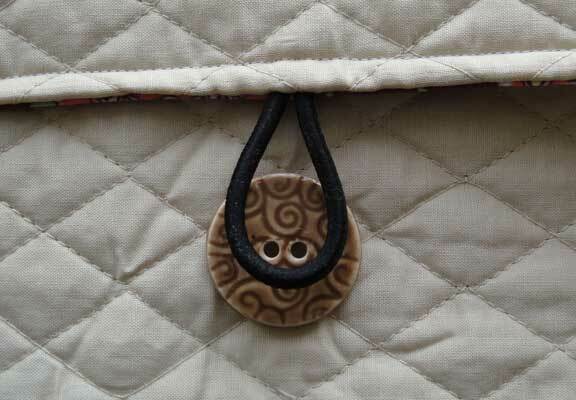 Fold over the top of your pouch and position your button into place. Handsew your button. I wanted the pouch to have some give, so I positioned the button a little bit higher than I had originally planned, but that's okay because the elastic hair tie can stretch to fit an overstuffed pouch. Step 9 - Use your pouch! Congratulations! You've made your pouch. Now use it and make many more to give away as gifts or to just use around the house. 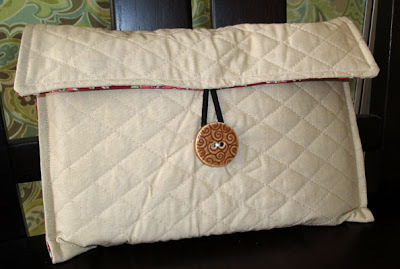 Would you like a custom-made pouch? Leave a comment by next Friday, September 24, with your favorite color. Depending on the number of comments I receive, I will select one or more names at random and each person will receive a pouch in the color mentioned in the comment. Well, of course green is my favorite color and combined with pink its even more favorite! I would love to have an adorable pouch for my Ipod Nano...I hope I win!!!! !